Jean-marc Hero opens The 8th World Congress of Herpetology to a large crowd in a beautiful ballroom in Tonglu. Last month, I was fortunate enough to attend the 8th World Congress of Herpetology, perhaps the largest herpetological meeting in the world. The event occurs every four years (or so), and this time was hosted by Hangzhou in China. As a Masters student working with Leopard Tortoises (Stigmochelys pardalis) in South Africa, I successfully applied for support by the conference organisers. The organisers have a great scheme in trying to encourage participation by student researchers whereby 40 students, myself included, would be partially supported (with food, registration and accommodation covered), and a further 8 students fully supported (as above, but also travel costs). To make the support and coverage even fairer, the students would be selected evenly from each of the ecoregions; Africa, Australasia/Pacific, Nearctic America, Neotropical America, Oriental Asia, Palearctic Asia, Palearctic Europe, and China. The scheme is one that should be admired. The conference committee and Jean-Marc Hero, in particular, should be commended! I certainly thank them for their support in allowing me to attend. I also thank the University of KwaZulu-Natal, and my supervisor, Colleen Downs, for helping to cover flights. As stated above, the Congress was to be held in Hangzhou, China from 15th to 21st August. Hangzhou is a very large city, just a short drive away from Shanghai. Given I usually stress myself out with travelling, I thought it wise to book an extra night before and after the Congress to buffer the stress associated with getting to and from airports and hotels. This, it turns out, was a wise decision! Before jumping to the talks and events of the Congress, I think it is important to discuss the happenings for which the congress will probably be remembered most by all attendees. Hangzhou has a major international airport, so most people (including me) elected to travel here. Others decided to travel to Shanghai airport, some 60 minutes away. My journey started in Durban, with flights to Johannesburg, Doha, and then eventually Hangzhou. Given that China does not allow the use of Facebook, Google or Gmail, I was prepared to be at least in the dark from the Western World for the duration of my stay. Fortunately, Outlook is available. As such, prior to leaving, I set up automatic forwarding of my emails from my Gmail account to my Outlook account. I left Durban two days before the Congress officially began, as did many others. I checked my emails as I waited for the second of my three planes in Johannesburg. I see an email from the conference organisers titled ‘Emergency: Notification on the Change of the Conference Venue, sent to all of the attendees. Apparently, the Chinese government were not too happy with the World Congress of Herpetology being held in Hangzhou. If you have heard of the city of Hangzhou in the news recently, it is because Hangzhou is also hosting the G20 summit. Despite the fact that the World Congress has been planned for Hangzhou for years, and at least the attendees were aware to book hotels in advance due to the G20 summit, the Chinese government decided that the Congress should not be held in Hangzhou. Apparently, it was due to heightened security, which I understand. Why they left it so late to tell us, I have no idea. Anyway, the rest of the email informed all attendees that the Congress was to be moved to Tonglu, a city not too far away from Hangzhou. Well, over an hour away by bus… A new venue had been found for the Congress, with a few suitable nearby hotels. Therefore, all previously-made reservations were due to be cancelled, with new ones made in Tonglu. In addition, free shuttles from Hangzhou to Tonglu were available to allow the attendees to reach the new venue. The conference organisers were kind enough to offer compensation for all financial losses for all attendees – I sincerely hope that they are also compensated by the Chinese government, as it is not the organisers’ fault! My panic was, not surprisingly, shared by several others. I met a few at Doha airport. In truth, I felt somewhat under-panicked. As someone that is usually so stressed about travelling, it was surprising that something so chaotic did not seem to faze me as much as expected. Perhaps it is because so many others were in the same boat as me. I guess also because I did not have to deal with sorting out accommodation myself, as a supported student. The rest of my travels to Hangzhou and then Tonglu were relatively event-free, so I shall now discuss the science of the Congress. 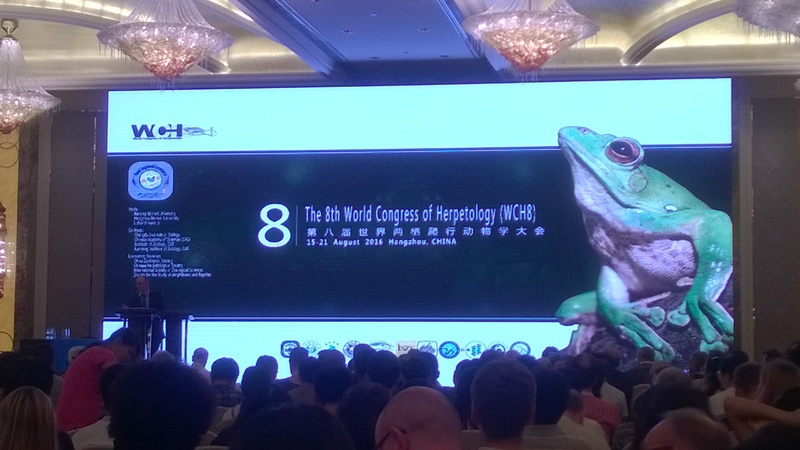 There were a lot of talks at the 8th World Congress of Herpetology. When I received the Handbook for the Congress, I was amazed at what I saw. Just four days of talks were planned, with a mid-Congress excursion planned. However, there were up to seven different talk venues, with a massive 456 research talks (I had to count this to get a number). Whilst I have not attended too many international conferences before, I doubt there are many that rival this, at least in the field of ecology. For previous international conferences, I am usually made to make a decision between two or three rooms, but having up to seven at the same time seemed astonishing. I think the handbook really made me realise how lucky I was to be given the opportunity to present MY research at such a big event. Among the many talks were several plenaries (45 minutes), with one from each of the ecoregions, a few mini-plenaries (25 minutes), and a handful of 5-minute talks. The rest of the talks were 15 minutes in duration, grouped into several seminars for similar topics; e.g. Biodiversity and Monitoring, Ecology and Physiology, and Captive Breeding and Conservation Strategies. This, at least, made it easier to pick a room to be in, though most people were hopping between venues to catch their preferred talks. I elected to stay in one room for an entire session for the majority of the Congress. I think it is unwise to even think about attempting to write up about all of the talks I attended. Instead, I will give a short summary for each of the plenaries I attended, as well as a few of the stand-out talks. Barry Sinervo is one of the World’s leading herpetologists. 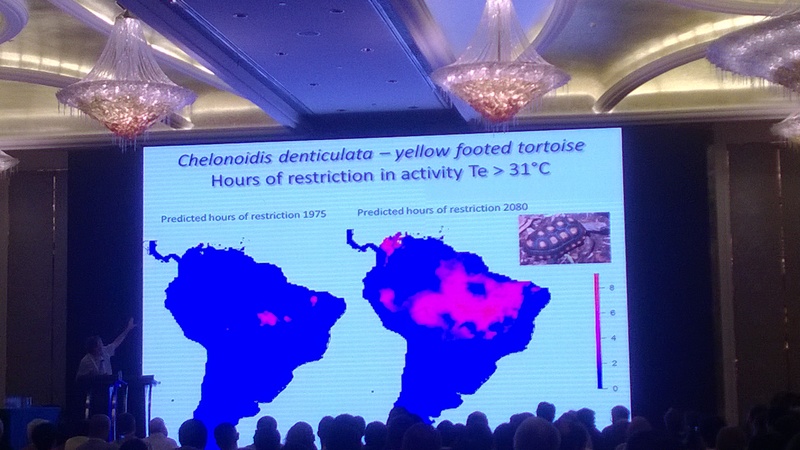 Aside from this plenary, Barry had two additional talks at the Congress both discussing species distribution models with respect to reptiles and amphibians, relating their distribution to water loss and projected changes in temperature with respect to climate change. Barry even hosted a workshop on the issue on one of the days, though unfortunately, it clashed with the mid-conference excursion. However, Barry’s plenary discussed the ongoing Mass Extinction event that is being observed in many taxa, comparing the current reptile and amphibian biodiversity crisis to past mass extinctions. In fact, Barry has previously presented on this topic in a TED Talks. The work presented by Barry in the plenary and the other talks was fascinating, but equally frightening. Using information on the hours of restrictive activity (i.e. the hours of the day in which an animal movement is restricted by being too hot or too cold), and predictive models for the effects of climate change, species distribution models can estimate the approximate distribution for species. Several researchers have published findings for a variety of species. The predicted hours of restriction in 2080 is expected to cause extinctions in a large proportion of the Yellow-footed Tortoise. Such research has predicted the extinction of several species, in some cases locally, but others completely. One of the examples used was the Yellow-footed Tortoise (Chelonoidis denticulata). In the year 2080, vast areas of South America will have largely increased hours of restriction, essentially eliminating the possibility of tortoise populations inhabiting these areas. This pattern for the local extinction of the Yellow-footed Tortoise also matches the extinction of the Amazon rainforest, whereby expected drought events wipes out the rainforest. Given these areas hold such a large diversity of reptiles and amphibians (and other taxa), it is extremely worrying. In fact, it seems that many reptiles will go down the same route, as most are restricted by temperatures. The situation for amphibians is even more dramatic, as they are restricted by water loss in addition to temperatures. As such, they are in a constant battle of being warm enough as well as wet enough. When temperatures are too high, amphibians also use water loss as a means to cool down, therefore exacerbating the problem. The expected changes associated with global climate change will cause many species to go extinct. I recommend watching the aforementioned TED Talks for further information, as well as information on reducing your Carbon Footprint. 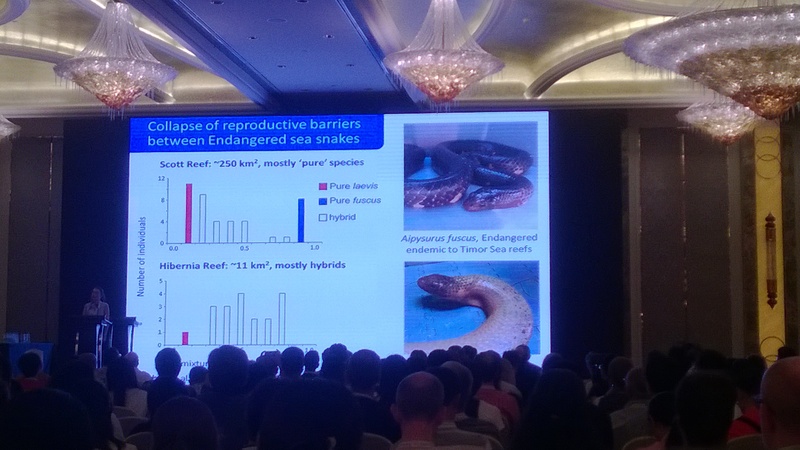 Dr Sanders, from the University of Adelaide, presented an interesting plenary on the radiation and speciation of Sea Snakes, focussing primarily on the Genus, Hydrophis. These snakes are Elapids, one of the venomous snake families, along with other Sea Snakes, Sea Kraits, and terrestrial Elapids. Dr Sanders obtained DNA representatives from 85% of all known Sea Snake species and used phylogenetic analysis to investigate speciation events. As you can see from the figure here, the rate of speciation for Hydrophis snakes increased dramatically some time ago, producing an average 0.333 species per million years, over double that of their relatives. It is believed that the many different coral reefs may have contributed to these speciation events, as different populations adapted to local conditions. For example, some species evolved to be macrocephalic (girth of the body similar to the girth of head) or microcephalic (small head compared to body), as species evolve to improve foraging techniques. The number of observed hybrids between closely-related species is increased where reefs are breaking down. However, many of these species are currently under threat, some of which is related to the ongoing breakdown of many reef systems, which previously produced reproductive barriers and sources for food. The breakdown of the reefs is bringing about an apparent increase in the hybridization of closely related species, which reduces fitness and genetic diversity. In addition, the ever-increasing demand for food – Sea Snakes are often captured as bycatch in prawn trawls – is also contributing to their demise. The third of the plenaries was about the roles of climate, topography and human activities on the dynamics of species range. Yi-ming investigated how certain invaders were able to spread across environments. One of the examples, perhaps unsurprisingly, was the Red-eared Slider (Trachemys scripta), probably the most invasive reptile in the world, now found in nearly all corners of the Earth. Yi-ming compared the niche selection of several species, looking at how their niche in their native range apparently loosens in alien environments. Some invaders were found to have extremely larger niche-shifts. This was found to be especially true in island endemics. The research appears to show that a large number of alien herpetofauna will invade tropical ecosystems, either by outcompeting existing species or finding a new niche. Further research also investigated the distribution and invasion of the Chytrid fungus (Bd – or Batrachochytrium dendrobatidis). Species distribution maps were created, and based on Yi-ming’s research, it appears that Bd will invade many regions across the world. This is particularly worrying, and it is expected that a number of species will succumb to the fungus. This plenary was probably the one I was most attached to, mostly for the reason that it was presented by Krystal Tolley of SANBI, South African National Biodiversity Institute. Whilst I had not met Krystal prior to this Congress, the talk was about Africa, of which I now have a passion, having worked there for two years. Ever Since Gondwana discussed how climate change, forest fragmentation and the spreading of savanna habitats influenced the biogeography of African reptiles, with a particular emphasis on chameleons and Atheris vipers. Krystal begins her talk by discussing the climatic conditions of Africa when it was once basically covered in forest, rather than the expanses of savanna that we see now today. Many reptiles back in these times had very large distributions, as the large forest habitats allowed for movement of species across the region, with few restrictions on gene flow. In such times, there were few chameleon species and few vipers. The majority of these were wide-ranging species, adapted to the forest. The fragmentation of the forests due to global cooling caused chameleons to move, specialise and speciate in new habitat types. These times were also perfect for forests. The climate was much warmer than it is today. However, the world soon underwent extreme cooling, in what Krystal described as ‘Greenhouse to Icehouse’. The cooling had large impacts on the continent, causing mass fragmentation of forest habitats. The chameleons were locally extinct in areas where forests could no longer persist. In addition, species in fragmented forests genetically diverged, adapting to very specific local conditions. They were once generalists, though became specialists to these habitats. In the current day, there are several chameleon species that exist in non-forest habitats. However, these only evolved at a much later date (~30 million years ago). A similar story is found in the Atheris vipers, with species adapting to fragmented forest habitats. Krystal signed off by discussing the knowledge we have of species richness maps. Krystal made a great point by expressing a concern of hers. Species richness maps often appear similar to maps showing record density maps. By this, Krystal expresses that just because an area does not appear to have much in terms of diversity on these species richness maps, it does not mean diversity is low – instead, it means that there may not be enough records. The most species-rich areas tend to be the areas in which we as ecologists carry out the most surveys – southern Africa, Central America, south-east Asia. Conservation funding is often provided more in areas of greater species richness, as potential threats to the ecosystem could wipe out a large number of species simultaneously. Therefore, in the areas where records are fewer, funds for research and conservation are less likely to be collected. Furthermore, the areas that are most threatened, for example by subsistence agriculture, are often the areas we know the least about. In such areas, we have no idea how much we have to lose! This was a very different talk. Ethnoherpetology is not really a field I had ever really considered in great detail. One aspect of ethnoherpetology that I have found myself talking about before is how everyone loves tortoises. As a tortoise enthusiast, I have yet to find someone that does not like them. Who can say the same about frogs, snakes, lizards, etc? I usually had discussed how children’s toys, stories and cartoons often have tortoises that are cute, wise or loveable (which they are), installing a life-lasting appreciation of tortoises for many. I guess I just never knew the term ‘ethnoherpetology’ even existed. Some of these phrases were ones that I was unaware of, but they are apparently popular in certain parts of the world. Indraneil’s talk on ethnoherpetology discussed the cultural differences and perceptions of reptiles and amphibians. He discussed how many different cultures have names for different animals, even if they have no real use. For example, in early human cultures, or even some of the more remote human populations, we always seem to have a name for every snake or frog. Why is it not sufficient to just have ‘snake’ as an all-encompassing term? Indraneil presented two theories for this; one by Diamond, in which he believed that every species has a potential use for indigenous people, and one by Berlin, who believed that man has an inherent curiosity of the natural world. Both of these seem like good reasons, so I suspect the truth is somewhere in between. The talk went on to discuss mythology (crocodiles were apparently banished from the land by bunnies – who knew? ), usage of reptiles/amphibians in phrases, food sources, as well as treatments (frogs/turtles for fertility, toads for witchcraft). This may all seem a bit strange for a Congress on herpetology, but Indraneil had a great point. Learning more about the cultural significance and the perceptions of reptiles and amphibians has implications for their conservation. That is extremely important. If ethnoherpetology can help, at least a little, why not? One additional point I found interesting was that Barry Sinervo brought up that as with any real science, there should be a control. Therefore, he suggested that it would be interesting to find a cultural group that had never experienced reptiles and amphibians. The only human community that would never have encountered reptiles and amphibians would be the Inuit people. I certainly would be interested in seeing how these people react to such animals! Whilst there were a few more plenaries (and mini-plenaries), I was unable to attend some of them. However, there were a few more interesting talks that I just can’t not talk about. For starters, my favourite talk of the entire conference was one by Richard Vogt. His talk was entitled ‘Communication and Social Life of the Giant South American River Turtle’. However, his talk was not solely about them. Some of the things that Richard discussed was, at least for me, mindblowing. As a long-term tortoise/turtle enthusiast, the research that Richard presented opened up so many possibilities for further research, conservation and understanding of tortoise ecology. For a long, long time, it has been believed that tortoises and turtles are essentially voice-less, with most people believing that the only noises they make are those funny sounds during mating, or the big ‘Huff’ as they retreat into their shell, expelling the air from their lungs. Any social aspects of their lives were previously thought to be via tactile, chemical or visual cues. However, using special microphones, Richard and his team have been able to record sounds for pretty much every species they have tested. The only thing is that the sounds are not audible to humans without these devices, and are extremely short in length, averaging 0.2 seconds per sound. This slide shows an example of one of the sounds produced by the turtles. Some sounds are even harmonic! 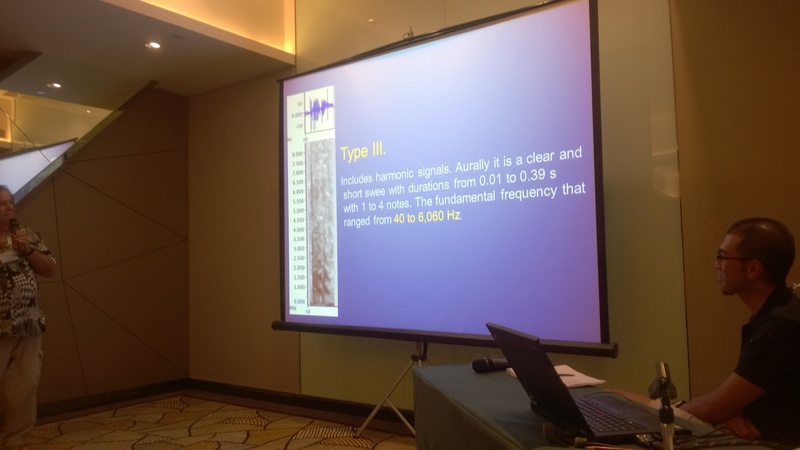 Not only that, but Richard’s team have been able to identify up to 17 different sound categories (e.g. fighting, courtship, etc). The example that Richard gave was the Giant South American River Turtle, a humongous species that averages 50-60kg in mass. This species is one that really has a proper social life, unlike many other species. There are large groups that bask together, migrate (up/downstream) together, and feed together. In addition, their egg-clutches all hatch simultaneously. How they do all of this was the foundation of the research. These microphones were placed in egg clutches. It was found that relatively early on in the development, the turtles start developing sounds, essentially talking to each other within the clutch. As time goes on, the communication develops, before they all hatch simultaneously. After this, they all move towards the river together, where their mother (yes, this species even has maternal behaviour) is waiting for them, talking to them. Together, the mother and her hatchlings migrate up the river. During this whole process, the hatchlings and the mother are continuously communicating. To me, this was just fascinating. One of my first thoughts was that this could be used as an additional conservation technique. The use of echolocation to identify species is readily used in bats. With the discovery of turtle communication, perhaps this could be used with turtles too? 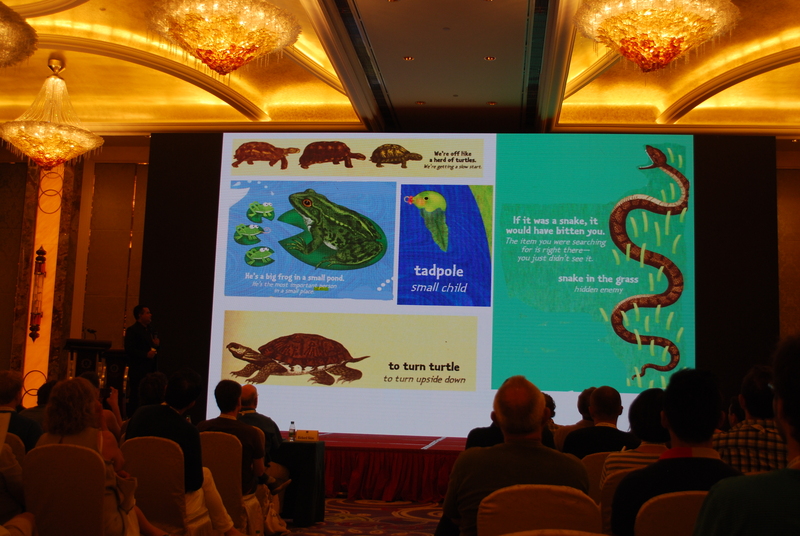 One of the other talks discussed that the Yangtze Giant Softshell Turtle is known from just 3 live specimens. If we found out what it sounds like, perhaps research could be used to search for similar sounds in the huge Yangtze river, or even use the sounds to attract any other individuals that are still hiding out there in the wilderness? The possibilities are truly endless. Parthenogenesis, if you need reminding, is the ability of a female to reproduce without mating. Such behaviour has been described in lizards, snakes, and various other animals before, but never before in turtles. Liu-wong and his team collected several of these turtles for testing. All the individuals collected were confirmed to be female. Some of them then went on to produce offspring during the time of the study. This itself is not confirmation of parthenogenesis – tortoises and turtles have the amazing ability of long-term sperm storage, sometimes with sperm being stored for several years – the female seemingly waiting until the habitat and conditions are perfect before allowing her eggs to be fertilized. However, Liu-wong went on to test this genetically. The offspring were compared to their mother genetically. It was determined that the probability of sexual reproduction was extremely low, suggesting that the initial proposal of parthenogenesis is likely to be correct. Other than my own, I found myself to be most invested in Richard Tracy’s talk about Desert Tortoises. The reason being was that Richard was presenting some research that I myself had helped to collect in 2012. 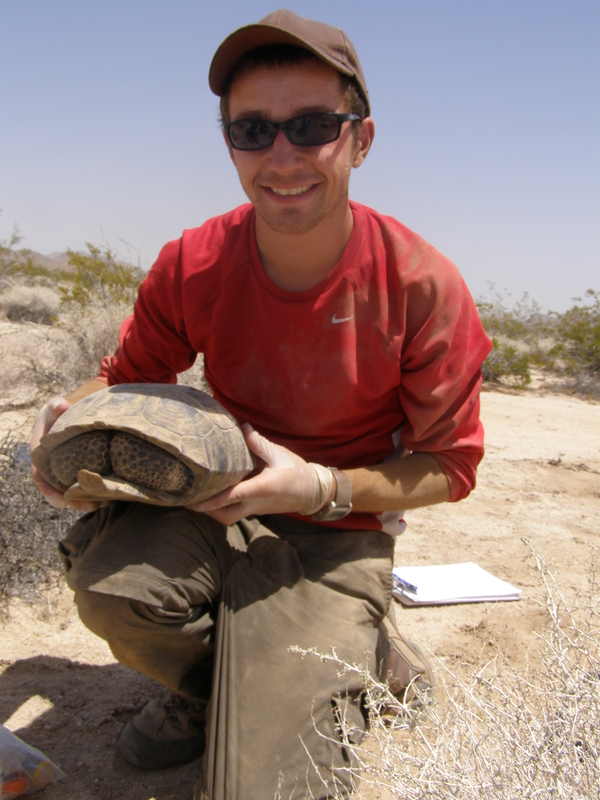 One of the Desert Tortoises I myself found in the Mojave Desert in 2012. Samples from this individual were used in Richard Tracy’s research. I had never met Richard before, but was one of a few students that helped Chava Weitzman with sample collections in the Mojave Desert a few years ago. For a little bit of back story, the Desert Tortoise is now considered endangered. One of the causes of this is believed to be the URTD (upper respiratory tract disease), a type of ‘cold’ that many wild specimens were found to have. This bacteria was first believed to have been introduced from captive populations – many individuals that people take in as pets are later released as they become too much of a handful. However, the research that Richard presented somewhat combats this. His students had been collecting blood and lavage (nasal) samples from wild individuals, simultaneously giving each a scale based on their condition. These samples were then cultured in the lab. It was found that many of the wild individuals that did NOT show any signs of the disease actually WERE infected, suggesting that the disease is widely prevalent in wild populations. Mycoplasma is shown to decrease in numbers at higher temperatures. The Mojave Desert regularly has temperatures in excess of 40°C. Furthermore, additional research showed that the immune system of infected individuals were extremely slow at fighting off the disease. However, the Mycoplasma was found to be suppressed by high temperatures. 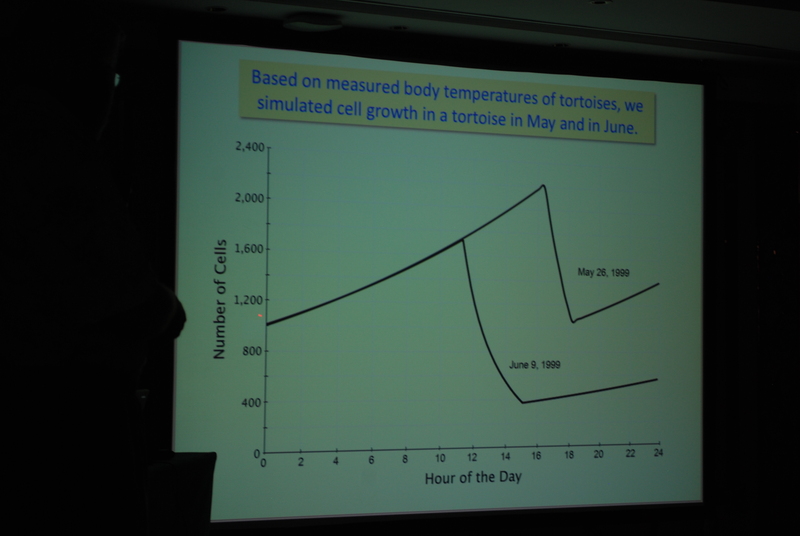 Given that the tortoises regularly experience such extreme temperatures (this I know from personal experience), it seems that the bacteria are in a constant state of growth and death, depending on the environmental conditions. 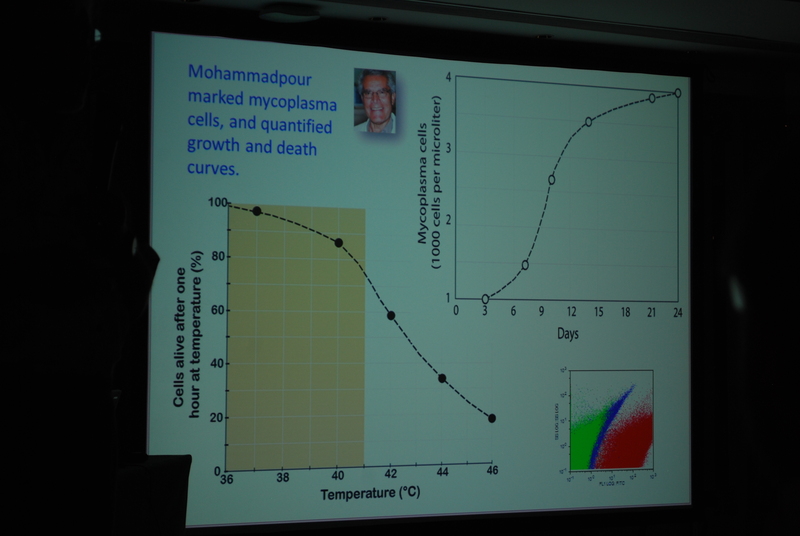 Graphs showing how the Mycoplasma grows and dies throughout the day due to experiencing various temperatures. Richard suggested that, with the warmer temperatures predicted from global warming, that perhaps these tortoises might even be better off, as more of the Mycoplasma is killed daily. This could then potentially kill off the disease. On the other hand, higher temperatures are expected to increase the hours of restrictive activity (as shown in other talks), potentially reducing access to food, water, and mating opportunities. At the risk of talking too much about tortoises and turtles, I think I will finish with an interesting study by David Penning from the University of Louisiana. David discussed intraguild predators – which is defined as predators that sometimes feed on other predators. Usually, this happens with one predator being much larger (>4x) than their prey. Imagine a lion attacking a fox, for example. However, Kingsnakes regularly prey upon Ratsnakes. In fact, during his research David recorded a Florida Kingsnake eating a Texas Ratsnake that was 120% it’s size! That is to say, the prey was 20% larger/longer than the predator. David tested many theories about how this would be possible – one would think the larger snake would be superior, but obviously size was not the number 1 factor here. It was found that muscle mass, prey response, speed, and several other potential explanations all come up insignificant. Finally, David was able to answer his question, when looking at how the two snakes constrict their prey – the Kingsnakes are much more efficient, coiling much tighter around their prey. The Ratsnakes, on the other hand, have a loose, messy coil, which is less efficient. David tested the constriction pressures, and sure enough, Kingsnakes have mucher higher constriction pressures than those of similarly-sized Ratsnakes. Thus, when there is a battle between a Kingsnake and a Ratsnake, there is only one winner. How one digests something that is larger than itself though, is another question! Having discussed several different aspects of the Congress, I think I will finish now. The Congress was fascinating, and I feel I learned so much. In addition, my own talk, in which I presented my research on home range and movement patterns in Leopard Tortoises, was a success. One last note, the next World Congress of Herpetology will be hosted by New Zealand in 2020. I strongly recommend that any budding herpetologists do their utmost to attend. The hosts even promise that attendees will be able to see the prehistoric Tuatara in the wild – wow! I hope that the above article is a decent enough summation of the large number of talks available to attendees, and hope that any readers found this article as interesting to read as I found it to write.